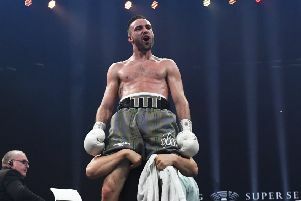 Edinburgh’s British super middleweight challenge belt winner John McCallum says he intends to move on to “bigger and better things” after his 78-74 victory over Dalton Miller at London’s York Hall on Saturday night. The 28-year-old was a class above his opponent throughout the eight-round contest and landed the cleaner shots despite the Englishman’s late attempts to overturn the judges’ scorecards in his favour. Much had been made of the match-up in the weeks prior to the duel itself after a heated exchange between the duo during a head-to-head question session in London last month. At one stage, chairs were even thrown in the direction of one another. However, the former Leith Victoria amateur had the last laugh on Saturday night by securing the ninth victory of his professional career which also went some way to erasing the disappointment at losing to former professional footballer Leon McKenzie at the same venue in October. McCallum will now jet off to Greece for a holiday with some friends before returning to assess his options with manager Steve Goodwin.